A year ago, Peter Jackson debuted the first piece of his new prequel trilogy series to the Lord of the Rings, The Hobbit: An Unexpected Journey. The book was originally supposed to be converted into a two-movie project, but the powers that be decided to extend it to a full trilogy of movies, with the third film arriving six months after the release of the second one. However, now fans have to wait another full year for the conclusion, with the third film having been moved to next December. In the meantime, The Desolation of Smaug is the new, middle entry to the latest trilogy. The film opens with a flashback to where Gandalf confronts the dwarf Thorin before the entire journey begins. This becomes a lead-in to the new film, a story which then picks up where An Unexpected Journey left off. Basically, the twelve dwarves, the hobbit Bilbo Baggins, and the wizard Gandalf are trying to reach the Lonely Mountain so they could defeat the dragon Smaug and Thorn could claim his rightful throne. To do so, they must brave a giant-spider-infested forest and the Elvish inhabitants in Northern Mirkwood. But Gandalf decides to leave the group and travel to Dol Guldur, where he aims to confront a growing evil (which proves to be a seemingly pointless moment in the movie). But it’s moments like these that Jackson uses to help set up The Lord of the Rings. At this point with the release of the first and second Hobbit movies, it feels kind of out of superfluous to add extra running time to an already long film to set up events that don’t really need any kind of additional setup. But alas, the journey continues for all of the characters in what is ultimately a Jackson-manipulated detour from the Tolkien source material. The big changes to the original story will probably upset purists, but it’s understandable that Jackson would want to adapt The Hobbit more to fit in with his film series. An Unexpected Journey caught a lot of flack for being long and uneventful, so it seems like Jackson tried to make up for it by adding lots of action throughout The Desolation of Smaug. For the most part, it helps the story move along quicker, especially since all of the characters, the story, and their goals have been set up at length in the first film. And if you’ve seen An Unexpected Journey a time or two, chances are you’re more than ready to see the evolution of Thorin and his company as they push on to the Lonely Mountain. 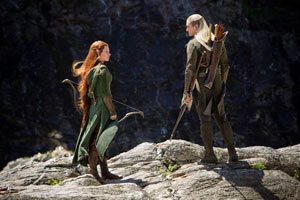 To bring some more continuity to the series, Jackson introduces the elf Legolas into The Hobbit, where he otherwise does not appear in the book. It feels a little odd to have him in the mix, especially with him being more rough and wooden here than in LOTR, and, of course, the handsome elf is now magically thirteen or so years older than he will appear in the “sequels” (and his eyes look really odd?). Don’t get me wrong, it’s fun to see him back in action, desimating orcs left and right, but it doesn’t really feel natural (kind of like how Lucas shoehorned Chewbacca into the last Star Wars prequel). Tauriel is a new elf character that does not exist in any of the books and is played by LOST‘s Evangeline Lilly. It’s unfortunate that she isn’t part of the original canon, but I did enjoy her addition to the series (even if it is muddled by the overall discontentment from fans toward her made-up character). She fits into Jackson’s world nicely and Lilly does a great job as an elf. Of course, she also serves as a weird object of affection for a couple of the characters, but it seems to be something created by Jackson only to fill a romantic void in the story. Because the pacing is faster, a lot more seems to happen in The Desolation of Smaug (than in the previous movie), with arguably the best moments involving the titular character of the dragon Smaug. 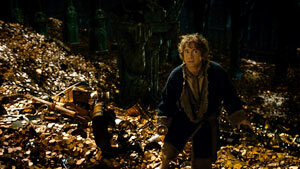 In the film’s climax, Bilbo Baggins, played by Martin Freeman, confronts the beast, who’s voiced brilliantly by Benedict Cumberbatch, in a wonderful sequence that brings to mind Bilbo’s exchange with Gollum in An Unexpected Journey, but on a more visually stunning, large, and captivating level. Smaug is a gigantic, menacing creature, especially when pitted against a diminutive hobbit, and the two engage in a sort of battle of wits as Bilbo attempts to distract him enough to retrieve the coveted Arkenstone. And for anyone who’s a fan of the BBC series Sherlock, it’s especially entertaining to watch a dragon voiced by Cumberbatch pursue Freeman as a hobbit. With any sequel, the question of if it’s better than its predecessor or not is always raised upon the film’s release, and The Desolation of Smaug is no exception to this unwritten rule. But it probably can all boil down to preference with a film like this. Desolation is far more action-packed than Unexpected Journey was, but Journey has an arguably stronger story than its successor. But for a series of films that have always worked together best as a whole and not in one-off doses, Desolation is a good film because of Unexpected Journey‘s setup. However, there’s still a lot that can be picked apart about this film (as with any one of the films in either trilogies). In some ways, Ian McKellen’s performance as Gandalf seemed as if he were over-acting and over-doing some of his line delivery this time around, and that may not be entirely his fault depending on how he was directed. Luke Evans is a good addition to the cast as Bard, but some of his scenes feel overly melodramatic, as does Lee Pace as the stiff elf king Thranduil. But my biggest problem with the film is entirely a personal phobia. The first big action sequence in The Desolation of Smaug is when gigantic spiders attack the dwarves and Bilbo in Mirkwood forest. In all embarassing honesty, I still can’t quite get through the Shelob scene in Return of the King (and dread it each time I watch the film), and I found myself squirming in my seat like a child having to use the potty as multiple large spiders swarmed and attacked Bilbo and the dwarves. They jump out at the screen in close-ups (and I didn’t even see the movie in 3D) and are frequently seen scurrying across treetops and webs. It’s quite honestly the stuff that an arachnophobe’s nightmares are made of. So, fellow spider-haters be warned: it’s very, very bad. Otherwise, the content for the film is on par with anything you’d see in The Lord of the Rings trilogy. Orcs are beheaded (and it’s shown on screen usually, albeit briefly) and impaled with arrows, while the large spiders are cut open, dismembered, and stabbed. There is a lot of action involving heroes battling grotesque and often frightening-looking orcs, and there’s a little bit of gore shown when orcs are killed from time to time. Lastly, a dwarf is shot in the leg with an arrow and we briefly see part of the wound a couple times (with bloody results). For the most part, if you’ve seen the other Hobbit or Rings movies, you can expect more of the same kind of content here. Overall, The Hobbit: The Desolation of Smaug is a more entertaining Hobbit film than An Unexpected Journey, but it still suffers from some moments that are far too corny and scenes that feel like unnecessary filler. To make matters worse, you will likely join in the rest of the theater in groaning at the abrupt ending that ends the film without any kind of wrap-up. It’s almost on par with the ending of Inception, but it’s the kind of ending that a TV show might give a season to keep you interested in coming back for the following fall. However, the fact that moviegoers have to wait a full year to see the resolution of this adventure is a painful one. The second Hobbit film, The Desolation of Smaug, arrives on disc to own two weeks after hitting the digital retailers. But Warner has released it in a loaded 5-disc 3D Blu-Ray set that contains the movie on 2 3D Blu-Ray discs, a 2D Blu-Ray disc for the film and another just for bonus features, a DVD of the film, and a code to redeem an Ultraviolet copy. You can also get the 3-disc 2D Blu-Ray/DVD/Ultraviolet set and a DVD set. The Hobbit: The Desolation of Smaug 3D – This 3D Blu-Ray release was my first time seeing a film of this series in 3D. Smaug was shot in 3D and so it often really pops out at the viewer while watching it. Sometimes the picture does look remarkably flat, but it does seem like any time you watch a movie in 3D, your eyes and mind adjust to it and it seems less and less “3D” as you’re watching. If you’re a fan of 3D movies, though, this is definitely a good one to check out. New Zealand: Home of Middle Earth, Pt 2 (7:11) – The first Blu-Ray release for An Unexpected Journey included a video segment very similar to this one. 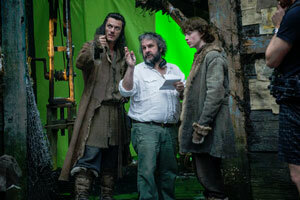 It’s a cast and crew reflection on shooting on location in New Zealand for The Hobbit films. They also show us more scenic shots from the country and then the final shot used in the film to show you just how naturally majestic the real landscapes are. It’s sort of a tongue-in-cheek featurette that doubles as a mini commercial for the beauty of New Zealand. “I See Fire” Music Video (5:42) – The “I See Fire” video, by Ed Sheeran, is presented like a music video but it sounds and looks like a making-of video and an acoustic version. It’s a little out of place here, but those who like the song should enjoy it. Live Event: In the Cutting Room (37:52) – Those who purchased An Unexpected Journey the week it released last March were treated to a special online event with Peter Jackson less than a week after the Blu-Ray/DVD release. On Monday, March 25, 2013, Peter Jackson took fans on a special tour of his office/studio while Smaug was being finished, and then settled into the Cutting Room to answer fans’ questions from videos and Twitter. Even better, however, are the guest questions from Lord of the Rings actors Dominic Monaghan (Merry) and Billy Boyd (Pippin) and Smaug first-timer Evangeline Lilly. There are also guest greetings from actors Luke Evans and Stephen Fry. Overall, it’s a fun bonus featurette. 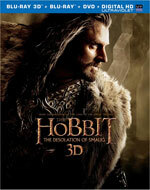 Trailers – There are two theatrical trailers for The Desolation of Smaug and 1 extended 3-minute preview. Then there’s a trailer for the Extended Edition of An Unexpected Journey and two Hobbit-themed video games (including a LEGO one!). Alcohol/Drugs: The film opens in a pub where characters are seen drinking. Blood/Gore: When fighting the spiders, Bilbo has some abrasions on his face; We see some orcs get beheaded while others have arrows run through their heads; When fighting the spiders, we see many of the them cut up, stabbed and in one instance, have all of its legs pulled off; While an elf interrogates an orc, Legolas is holding its head by the hair. The elf throws or slashes a blade at it and it’s obvious that the head was severed from the body. Legolas drops the head (not shown) and we see both the head and headless body on the ground twitching; A dwarf is shot in the leg with an arrow and we briefly see part of the bloody wound. Later, we see the area is more black than red in color; Legolas wipes some blood from his nose; Gandalf has some abrasions on his face; The side of Thranduil’s face melts away briefly to reveal the muscle and such underneath, looking like a burn of some kind, but then it covers back over perfectly with skin; Thorin and the dwarves find a room that has become a tomb for semi-mummified, deceased dwarves. Inside, we see many dwarf corpses that are skeletal but with mummified skin still on their dead bodies. Violence: (Some potential spoilers ahead!) Some shady looking characters seem like they’re about to attack Thorin in a pub but Gandalf shows up and they back off. Gandalf then tells him there’s a price on his head; We see a menacing bear-like beast that chases the dwarves into a house; When the company of Thorin enter the Mirkwood forest, they’re attacked by gigantic spiders and wrapped up in webs. 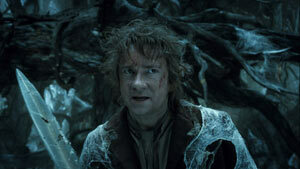 Bilbo fights and kills a spider and then frees the dwarves before more spiders come and they fight those. Just when they’re about to be overcome by the spiders, elves Legolas and Tauriel show up and slice open and stab and kill the rest of the spiders. They then take the dwarves prisoner; When the dwarves float down a river in barrels, orcs attack them while elves fire arrows at the orcs. We see many orcs beheaded or impaled by arrows, while one dwarf is hit in the leg by an arrow. Another moment involves Bombur, while stuck in his barrel, bouncing across the heads of dwarves and into orcs, plowing them down. He then busts out the sides of the barrel with axes in hand and continues fighting them before returning to the river. Legolas stands on the dwarves’ heads while shooting at orcs; Thranduil unexpectedly beheads an orc he’d promised to spare the life of. While we don’t see the impact, we hear it and see the face of the orc go dead. We then see the head and body twitching on the ground; The arrow is broken off the dwarf’s leg with the arrowhead still stuck in his leg; Gandalf and the Necromancer battle each other with their powers. A white bubble of power flows from him while a black cloud of evil flows from the Necromancer. Gandalf’s staff is then obliterated and he’s thrown against a wall; Orcs attack a family in Laketown and the dwarves and Legolas with Tauriel fight them off; Legolas gets into a one-on-one fight with a big orc; Smaug chases Bilbo around the castle at Lonely Mountain, blowing fire at him. Smaug then chases the dwarves and Bilbo around the castle, breathing fire at them as they run away. They try to fight back by dousing him in molten gold; We see a flashback to the flashback in the first film where Smaug destroys Laketown; And other sci-fi/fantasy action violence. Posted in Blu-Ray, Featured, Reviews, TheatricalTagged 3D, Evangeline Lilly, Ian McKellen, Lord of the Rings, Luke Evans, Martin Freeman, middle movie, Orlando Bloom, Peter Jackson, Richard Armitage, sequel, Smaug, THE DESOLATION OF SMAUG, The Hobbit, The Hobbit: The Desolation of Smaug, Tolkien, Warner Bros.